i. Absentee ballots where it is claimed that the voter complied with the requirements of Minnesota Statutes § 203B.12, subd, 2.
ii. Absentee ballots where it is claimed that the voter's non-compliance with Minnesota Statutes § 2038.12, subd. 2 was not due to fault on behalf of the voter. b. Contestants estimate the total number of these ballots to be 4,797.
c. Contestants are limited to presenting evidence on only those ballots that were specifically disclosed to Contestee on or before January 23,2009. 2. Any other relief not specifically provided herein is DENIED. 3. The attached memorandum is incorporated herein by reference. [I]n order for Contestee to be given a fair opportunity to meet the asserted claims, Contestants are limited. to the individual voters whose ballots they believed were wrongly rejected prior to the commencement of trial, Contestants, therefore, are limited to presenting evidence on only those ballots that were specifically disclosed to Contestee by name as of January 23, 2009. 1. Contestants' Motion for Summary Judgment is DENIED. C2. Represents the 4,797 absentee ballots as estimated within section 1.b by the Coleman campaign. The ruling in 1.b does not apply to the Franken campaign in any way shape or form because the request was filed by Franken requesting restrictions upon Coleman. The Coleman campaign did not append any requests to Franken's motion, as they are allowed to do, requesting restrictions on Franken. If there was no request for restrictions, restrictions cannot be created. C3. This circle explicitly outlines section 1.c, although the exact number of presentable ballots remains unclear. The best guess I can provide stems from the original election contest filing; on page 36 the document reads, "the Coleman campaign contends that there are 654 [rejected absentee] ballots, in addition to those identified by local election officials, that should be examined." 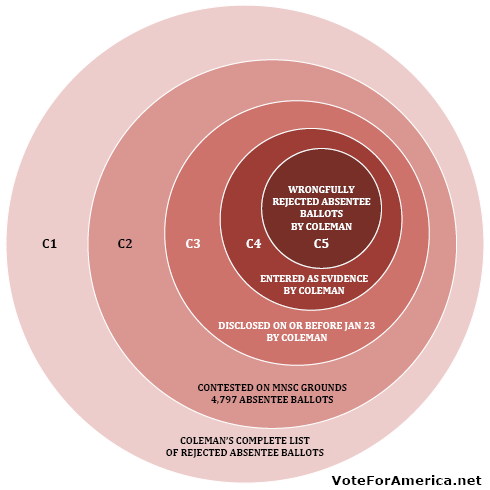 The Coleman campaign disclosed at least 654 specific, rejected absentee ballots before the January 23rd deadline. C4. This circle deals with the future tense and represents the ballots which will be explicitly presented as evidence to the court by Norm Coleman. 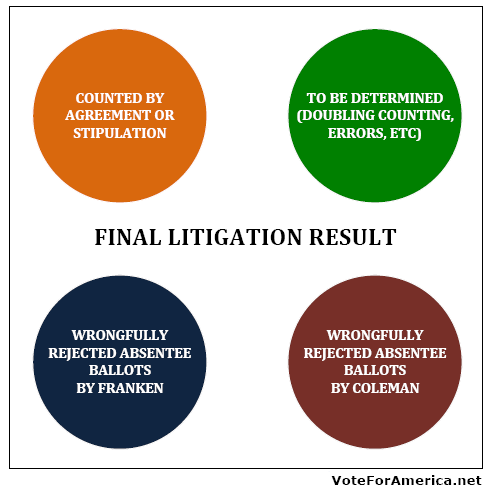 Franken will be allowed to file rebuttal evidence on any ballot Coleman presents to the court within this subset. C5. This final circle represents the final number of currently rejected absentee ballots that will eventually be counted that were originally presented by Coleman. The Election Contest Court uses the adversarial legal system; each side presents their side of the issue and in doing so both sides are represented. This, in theory, ensures that each ballot, presented by either side, receives fair consideration. Coleman's side is very well established, while Franken's is less understood. 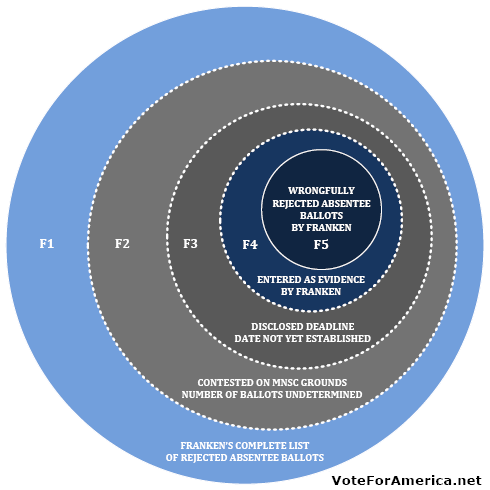 To begin defining Franken's outer circle, I will make an assumption; Franken wants to maximize the ratio between potentially rejected absentee ballots and potential Franken votes. In other words, Franken wouldn't submit a rejected absentee ballot if it is more likely to contain a vote for Coleman; the burden is on Coleman to ensure that each ballot cast for Coleman is considered in accordance with the ECC. Contestee, Al Franken ("Franken"), certified as having been chosen as United States Senator by the people of Minnesota in the November 4, 2008, election ("Election"), files this Answer to the Notice of Contest ("Notice") filed by Contestees Norm Coleman and Cullen Sheehan (collectively, "Coleman"). 5. Franken has identified a large number of absentee ballots that were rejected in error by election judges and local election officials, and which were not included on the list of 1,346 wrongfully rejected absentee ballots created by local election officials, and were not counted as part of the recount. In Exhibit D, for each voter identified below, Franken attaches declarations from each voter and/or other supporting documentation demonstrating that local election officials rejected each ballot in error. 6. In a number of precincts not selected by Coleman, ballots went missing between Election Day and the recount. Under Minnesota case law, a ballot serves as the best evidence of a vote. But when ballots are missing, or their integrity is otherwise compromised, election officials must turn to the next best evidence: here, the vote totals provided by election officials on Election Day. Where, as here, actual ballots cast on Election Day cannot be found, local election officials must submit-and the State Canvassing Board must accept-the Election Day return as reflecting the proper tally of votes for purposes of the canvass, the recount, and the Board's certification of the results under Minn. Stat. § 204C.33. 9. If and when Coleman is allowed to and does identify the "numerous precincts throughout the State of Minnesota," and proves that irregularities did, in fact occur during the recount, Franken reserves the right to identify additional precincts in which the numbers of original ballots and duplicate ballots were not identical and propose procedures whereby all identified precincts are treated uniformly with respect to inspection and relief, if any, ordered by the Court. 11. Under Minn. Stat. § 201.014, subd. 2, individuals convicted of felonies whose civil rights have not been restored are ineligible to vote. Under Minn. Stat. § 204C .13, if election judges determine that a voter is not eligible to vote, they must place the ballot of that voter unopened among the spoiled ballots. Contestee Al Franken moves for leave to amend his Answer and Counterclaims in light of the Court's Order dated February 3, 2009, allowing Contestants to pursue claims involving approximately 4,800 absentee ballots. Specifically, Contestee intends to amend his counterclaims to reflect his continuing review and analysis of the approximately 11,000 rejected absentee ballots. Among other things, Contestee will further refine Exhibit E to the Second Counterclaim, eliminating some ballots and adding others. The Franken filing does not however reference any specific changes and for this reason it is likely to fail. The Coleman campaign has yet to file a response. F2. The Election Contest Court has yet to determine the number of ballots from Franken's list, estimated at 794, that qualify for consideration under 1.a.i and 1.aii. It is possible that F2 is a subset of C2, but the information expressed in 1.b is somewhat unclear. Are there 4,797 total absentee ballots meeting the requirements expressed in 1.a.i and 1.aii, or are there 4,797 absentee ballots that Coleman has cherry picked that meet the restrictions? If the first statement is true then F2 is a subset of C2, otherwise it is not and the total universe of considerable rejected absentee is whatever Franken's list is determined to be plus the 4,797 in which Coleman is already restricted. F3. This region represents the number of ballots that are eligible for future consideration and may be presented as evidence. Coleman will be allowed to file rebuttal evidence on any ballot Franken presents to the court within this subset. F4. These are the ballots that will eventually be presented to the Election Contest Court as evidence. Like C4, this region is not explicitly defined, although the aforementioned 794 will likely be eligible. F5. This final circle represents the final number of currently rejected absentee ballots that will eventually be counted that were originally presented by Franken. It remains to be seen how these various sets of ballots will be counted but the review will not be done on a ballot by ballot basis. The court will likely request an election inspector to examine all ballots in a certain subset if the Coleman campaign is able to prove that there were inconsistencies when applying election statutes or if there were generic equal protection violations. In any case, the Election Contest continues and the burden still lies upon the Coleman campaign. Full Disclosure: The empirical information is authoritatively correct, but my interpretation of the legal proceedings may not be accurate. If you notice any legal fallacies, please alert me of my error; I am not a legal expert, but I have thoroughly researched the preceding article. Great work! Thanks so much. Do you think the IRAB leftovers (challenged in December by either campaign and thus not counted), i.e., 1346 - 933/951/954, or approximately 400 IRABs, will become part of the orange circle ("counted by agreement or stipulation")?